Tsunamis are primarily a coastal event. Any tsunami would be largely dissipated 50 miles up the Columbia River, well before Longview, Washington, and likely just a few miles beyond Tongue Point, just East of Astoria. The Oregonian’s Tsunami Maps show Evacuation centers on the coast. Hayden Island residents are unlikely to experience any Tsunami effects, but would likely feel severe shaking, liquefaction, moorage instabilities, bank landslides, and high currents which can damage ships and piers, according to Oregon Geology. Liquefaction may be Hayden Island’s biggest issue causing home foundations, power poles and natural gas/water pipes, to slide around A LOT. That means no water, power or gas, probably for weeks. Manufactured homes may be split down the middle since they’re not fastened to a solid foundation. Liquifaction is most often observed in sandy soils (like those of Hayden Island). Portland International (PDX) sits on soil prone to liquefaction while FEMA’s primary backup, Redmond airport (RDM), is 145 miles southeast. Much of Portland is prone to liquefaction, says Yumei Wang, who leads the Geohazards team at the Oregon Department of Geology. Huge swathes of land along the Columbia River, including PDX, are at high risk as are most of the Willamette River’s banks. Portland’s map of unreinforced masonry buildings shows nothing on Hayden Island. Downtown is the trouble spot. OPB’s app lets you enter your Oregon address for a custom report on your seismic risks and how to prepare. The Blast Zone mapping tool shows the DOT evacuation zone and the Potential Impact Zone in case of Oil Train Fire. The Oregon Fire Marshall recommends that in the event of a large oil train incident/spill, downwind evacuation should be at least 1,000 feet and if the car is involved in a fire, evacuation for 0.5-mile (800 meters) in all directions is recommended. That would be much of Hayden Island if the BNSF mainline in Vancouver is affected. The Oregonian created this Google Map flyover of the 3 routes Pembina could take through Portland to transport their propane trains (every other day) to the Port of Portland’s Terminal 6. The orange overlay is a mile wide evacuation zone required by regulators in case of a derailment. 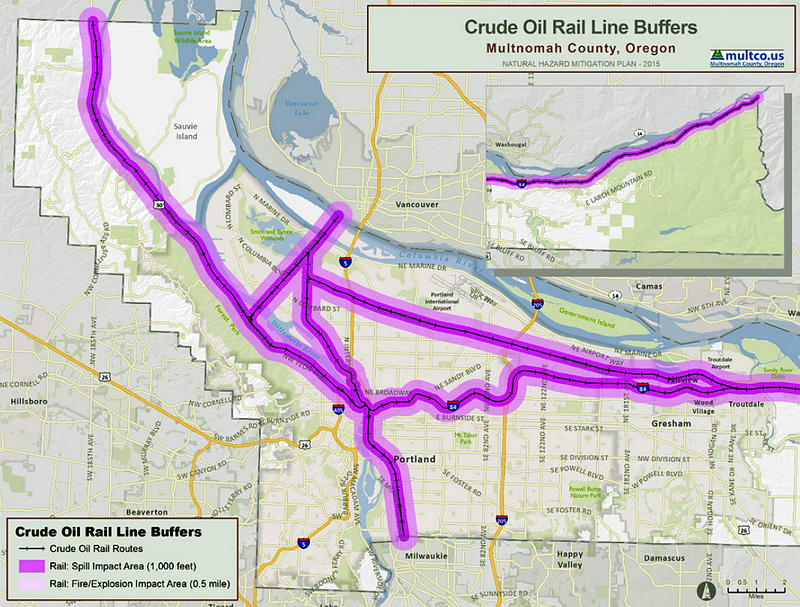 BNSF’s route through Vancouver carries most of the Balken crude north to refineries in Pudget Sound. Oregonian’s flyby shows evacuation zones in red (.5 miles either side of a fire). A derailment and fire in Vancouver would result in evacuation of most of city.